He was a brutal tyrant, but he remains an important symbol of strength for disillusioned Sunnis throughout the region. In the predawn hours of December 30, 2006, Saddam Hussein stood calmly at the gallows, as one of his three executioners—men in black ski masks and leather jackets—prepared to slip a thick yellow noose around his neck. Hussein stepped toward the platform that would soon open up beneath him. Several men recited, “Muqtada, Muqtada, Muqtada,” referring to the Shiite cleric Muqtada al-Sadr, who had led a rebellion against US troops in Iraq. “Go to hell,” one man yelled. “Long live Muhammad Baqir al-Sadr,” another group chanted. Grand Ayatollah Muhammad Baqir al-Sadr had been one of the Shiite world’s leading theologians and a founder of the Dawa Party, the Shiite Islamist group to which many of Iraq’s new leaders belonged. He had been executed by Hussein in 1980, as the Baathist regime prepared for war with Iran. As a martyr, Sadr would become a symbol of Shiite defiance and resistance to Hussein’s rule. To Sunnis, the video of his execution showed that an angry, lawless mob of Shiites killed Hussein. The room quieted briefly, and Hussein recited the single-line Muslim profession of faith, the shahadah (“There is no god but God, and Muhammad is the messenger of God”). As he repeated it, he was hanged. Hussein’s execution was videotaped and an edited version was broadcast by Iraqi state TV without sound. But this scene was also captured on grainy cell-phone video, with sound, and that video was broadcast throughout the Arab world. To Sunnis, the video showed that an angry, lawless mob of Shiites killed Hussein. The dictator’s calm, defiant responses to the taunting made him seem like the embodiment of law and order—at a time when Iraq desperately needed a way out of chaos. The impact of these images and sounds—of witnesses taunting Hussein in his final moments, before the dawn call to prayer—should not be underestimated: the execution created a new schism in Sunni-Shiite relations. Aside from the leaked video, the government of then–Iraqi Prime Minister Nouri al-Maliki made another fateful mistake: it executed Hussein at the start of Eid al-Adha, one of the two holiest Muslim holidays. Typically, Middle Eastern regimes pardon prisoners around the holiday. By refusing to delay the execution, Maliki added another insult to the Sunni world. Hussein’s execution cemented his status as a Sunni and Arab nationalist martyr. Nine years later, he remains an important symbol for Iraq’s disillusioned Sunni Arab minority. His legacy as a supposedly strong leader who kept Iraq together, by brutal force, also reverberates for Sunnis in the wider Middle East, which is wracked by sectarian conflict and stalled revolutions. Under Hussein’s rule, Iraq became one of the richest and most developed countries in the Arab world. Saddam Hussein rose to power in the 1970s on a wave of nationalist, revolutionary sentiment that had been sweeping the Middle East for years. It was a time of upheaval, in which the political and feudal elites—the allies of the old European colonial powers—were losing their grip. In Egypt, a young military officer named Gamal Abdel Nasser had led a revolt against the British-backed king in 1952. Nasser’s revolution inspired a wave of rebellions in the 1950s and ’60s, stretching from Libya to Syria to Iraq. By the early 1970s, Hussein oversaw the seizure of Iraqi oil assets from foreign companies just as oil prices were beginning to rise sharply. After nationalizing the oil industry, Hussein used the profits to modernize Iraq’s countryside by distributing land to farmers and mechanizing agricultural production. He also led a campaign to expand education and healthcare; build roads and highways; and create new industries. Iraq became one of the richest and most developed countries in the Arab world. But Hussein also ruthlessly suppressed all opposition and dragged his country into two successive—and spectacularly destructive—wars with its neighbors. Under his rule, hundreds of thousands of Iraqis were arrested, tortured, executed, or disappeared. His ruling Sunni Arab minority persecuted the country’s Shiites and ethnic Kurds. For much of his reign, and especially after he invaded Iran in 1980, Hussein was backed by the United States, Europe, and most Arab governments. Hussein had feared that Ayatollah Ruhollah Khomeini, the charismatic leader of Iran’s 1979 Islamic revolution, would inspire the Shiite majority in Iraq to rise up against Baathist rule. During the eight-year war with Iran, the United States and other Western powers supplied Hussein with weapons and military intelligence that prolonged the fighting. It was only after he invaded Kuwait in 1990 that the West turned against him. Despite a disastrous loss to a US-led alliance in the 1991 Gulf War, Hussein clung to power and survived more than a decade of United Nations sanctions and weapons inspections. After the 2003 US invasion, Hussein became the first modern Arab leader to be deposed by a foreign power. After a trial marred by charges of US interference and procedural flaws, an Iraqi court convicted him of crimes against humanity and sentenced him to death by hanging. That earned Hussein another distinction: as the first modern Arab ruler to be tried and executed for his crimes. Sunnis framed the hasty execution as an act of sectarian vengeance, shrouded in political theater and overseen by the American occupation. In several Arab capitals, Sunni protesters railed against the United States, Israel, and “Persians”—a code word for Shiites. Sunnis across the region saw the United States and the Shiite-dominated Iraqi government as killing off the last vestiges of Arab nationalism. Although Hussein was once a dependable ally of the West, by the 1990s he was among the few Arab leaders who defied the United States and European powers, at least rhetorically. In the Sunni view, America and its allies eradicated the idea of a glorious Arab past without offering any replacement for it, other than sectarianism. In Beirut in the days after Hussein’s execution, I watched as his killing heightened a sectarian battle between Hezbollah and its Sunni and Christian rivals. I was in Beirut during Hussein’s execution. In the days that followed, I watched as his killing heightened a sectarian battle between Hezbollah, the Shiite Lebanese political movement and militia supported by Iran, and its Sunni and Christian rivals, who were supported by Saudi Arabia and the United States. Lebanon was a case study in blowback from the Iraq War. By January 2007, Lebanese Sunnis felt besieged. Fearing that the sectarian bloodbath in Baghdad would spread to Lebanon, and fearing as well Iran’s regional power, they began to lash out at Shiites. As they confronted Hezbollah supporters during a nationwide strike in late January, some Sunnis waved posters and banners praising Hussein. It was a rich contradiction: Sunnis aligned with the United States carrying posters of Hussein, a dictator that America had spent billions of dollars and lost thousands of lives to depose. But in other ways, it was also a declaration of sectarian war: Hussein had killed hundreds of thousands of Shiites in Iraq, where many Lebanese Shiites have relatives, and the two communities—Lebanese and Iraqi Shiites—have had close ties for decades. One of Hussein’s legacies is the marriage of convenience between Baath Party officers and Sunni militants of ISIS. Today, Hussein leaves a new legacy in Iraq: a marriage of convenience between former officers of his Baath Party and Sunni militants like those of the Islamic State in Iraq and Syria (ISIS). 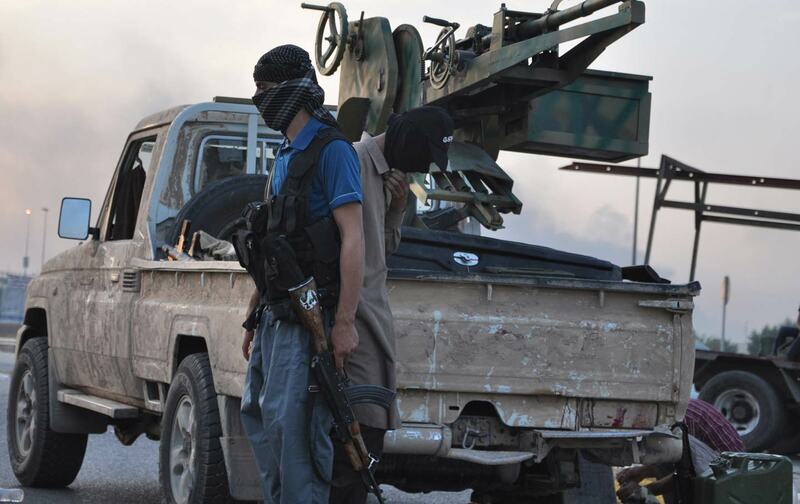 The jihadists assumed the most prominent role as they swept through northern and central Iraq in mid- to late-2014. But they were able to capture large swaths of territory from the Iraqi government thanks to an alliance with a network of former Hussein regime loyalists who had deep ties to Sunni tribes in cities like Mosul and Tikrit. After taking control of Mosul and other Sunni cities, ISIS leaders pushed aside the ex-Baathists or absorbed them into the group’s ranks. After US forces ousted Hussein’s regime in April 2003, several top Baathist officials, including Douri, went into hiding and began to mastermind the Sunni-led insurgency. In the fall of 2003, American officials said Douri was involved in recruiting foreign jihadists and funding attacks on US troops. That assessment was based on accounts from captured members of Ansar al-Islam, an Al Qaeda–linked group that carried out a series of suicide bombings against US forces and Iraqi civilians. US officials said Douri and other ex-Baathist leaders then fled to neighboring Syria, where they reportedly worked with Syrian intelligence operatives to reestablish elements of the Baath Party within Iraq. After Hussein’s execution, the ex-Baathists became more active through the Naqshbandi Order. Some ex-Baathists also enhanced their alliance with the Sunni militants of Al Qaeda in Iraq, which would later morph into ISIS. Both the Baathists and Islamic militants were able to cultivate support from ordinary Sunnis who were alienated by the sectarian policies of Nouri al-Maliki, the Dawa Party leader who served as Iraq’s prime minister from 2006 to 2014. In recent months, investigations by several news organizations, including The Washington Post, Der Spiegel, and Reuters, revealed that former Iraqi Baathists are playing a key role in ISIS, especially as leaders of its shadowy military and security apparatuses. Because the Baathists have deep social, financial, and cultural ties to many areas that are now under ISIS control, it will be difficult for the Iraqi government to dislodge the militants from those areas. And even when Baghdad has recaptured territory, the militants and their Baathist allies have undermined the central government’s efforts to restore order. Since the new Iraqi prime minister, Haider al-Abadi, took office in September 2014, Sunni political leaders have made several demands on him: amnesty for tens of thousands of Sunnis imprisoned—in many cases without judicial review—by Maliki’s regime in the name of fighting terrorism; greater power in the new government; an end to aerial bombardment of Sunni towns; and a more significant role in the Iraqi security forces, which Maliki had cleansed of many senior Sunni officers. Today, Shiite militias often take the lead in the fight against ISIS and other jihadists, and in the process are further alienating the Sunni community. Many Sunnis cringe at the memories evoked by the reestablishment of Shiite militias, which carried out widespread kidnappings, torture, and killing of Sunnis during the sectarian war that raged in Iraq from 2005 through 2008. In a February 2015 report, Human Rights Watch found that Shiite militias escalated their abuses in Sunni areas as they carried out new offensives against ISIS. The militias have been accused of forcing thousands of Sunnis out of their homes, kidnapping or detaining hundreds of residents, and summarily executing 72 civilians in Diyala province. After his ignoble death by hanging, Hussein remains a potent symbol that inflames sectarian tensions. He was buried in a tomb in his birthplace of Awja, a town near the city of Tikrit and about 100 miles north of Baghdad. While the mausoleum was not as lavish as the ostentatious palaces Hussein had built for himself, the site was intended by his fellow tribesmen to burnish his legacy as a nationalist and pan-Arab hero. Hundreds of people toured the tomb each week until the Iraqi government closed it to the public in 2012. Posters of Hussein covered the mausoleum, photographs of different stages of his life lined the walls, and a large Iraqi flag was draped on his grave. In March 2015, Hussein’s tomb was reduced to rubble as Iraqi security forces and Shiite militias fought to regain control of Tikrit from ISIS militants. Months earlier, worried that Shiite militias or ISIS would destroy the tomb, members of Hussein’s tribe had moved his remains to a secret location. But the destruction of his tomb became another chapter in the sectarian war of images, with Sunnis blaming Shiite militias even though ISIS may have damaged it just as badly. The militias planted their flags in the rubble, along with pictures of General Qassem Soleimani, commander of the Quds Force of the Iranian Revolutionary Guard Corps. Soleimani has led Iran’s campaign to stabilize the Baghdad government; train and equip thousands of Shiite militia fighters; and coordinate efforts to recapture territory from ISIS. On some walls in Tikrit, Persian graffiti read, “Khomeini’s army defeated ISIS.” It was a message from the Shiite militias: in death, the legacy of Iran’s Ayatollah Khomeini would outlast that of Saddam Hussein. But in reality, Hussein’s legacy will continue to haunt Iraq as long as Sunni grievances are unresolved, and the country’s new Shiite rulers resist sharing power with the Sunni minority. At the same time, Sunnis need to move beyond pining for the glory days of Hussein and his brutal Baathist regime—a reign that set Iraq on a path of destruction.